I’ve been visiting Christmas Markets the past few weeks and am enjoying the lebkuchen, plank-roasted salmon, candied fruits, and mulled wine that’s been on offer. But it’s clear that the mulled wine is the beating heart at the center of these markets. The promise of a warm tipple is what brings many people out to German Christkindlmarkts after the sun has dipped low and cold blankets the town. Gluhwein stands abound, and the people stand around! And, if you want “gluhwein light,” you can cut the wine with some ratio of cranapple juice and sip all holiday long without getting drowsy. Gingerbread is another favorite at holiday markets. The Germans have their lebkuchen, and the French have their pain d’epices. Today, however, I’m bringing you a wickedly good gingerbread recipe from the Brits. This gingerbread is at its best when it’s warm–maybe 10 or 15 minutes out of the oven. The top is moist, the sides are gooey, the full ginger aroma is in play. Just thinking about it makes me hungry. Guten appetit and Merry Christmas!! A couple of Christmases ago we rather incongruously found ourselves drinking gluhwien and eating curry-wurst in the Roppongi Hills area of Tokyo. At the moment in Bangkok it’s just too hot. But this time next week we’ll be back in the UK and I will be drinking my fair share. 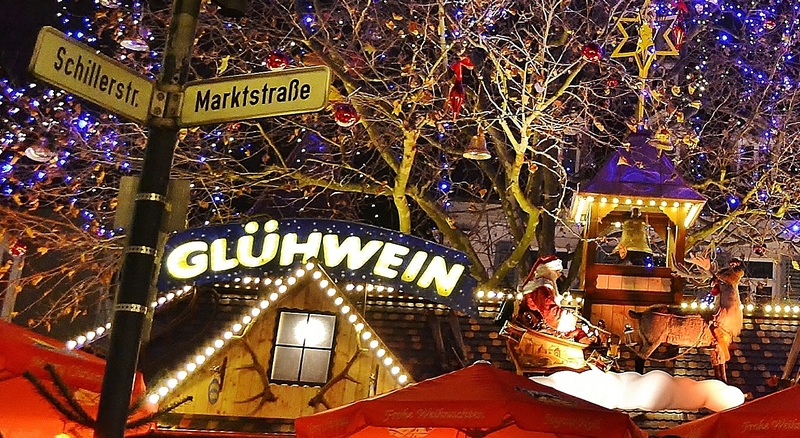 Gluhwein and curry-wurst in Tokyo? Is that even allowed!?! Enjoy the UK–and eat some mincemeat pies for me!